After completing my M.A. in Counseling Psychology from Trinity Evangelical Divinity School (1980) my first professional job was working in a private practice owned by two psychologists. In my third year of practice, I cut back to go full-time for my doctorate at the University of Wisconsin, Madison. For the next 2.5 years, I did therapy one day per week until I had completed my coursework. Midway through my coursework, a partner and I started CCC each of us on a part-time basis while sharing one office in the Centennial Building in Schaumburg. When done with my coursework, I got back to full-time practice and two things happened. I took a two-day-per-week job at Central DuPage Pastoral Counseling Center (CDPCC), a not-for-profit in Glen Ellyn. Secondly, I was placed on the Willow Creek referral list. Between the two, my clinical work grew considerably. Once I was taking the practice more seriously, some fears began to grow. Firstly, I became concerned that my practice was too dependent on the referrals from Willow Creek, a large mega-church in the area. I had seen how frequently and quickly Willow could change direction, and I felt vulnerable. Secondly, I found it quite challenging to be working in a not-for-profit. I could see that my future was in private practice so set out to create the stability I needed for my family and myself. After a summer of anxious, sleep-shortened nights in 1985, these issues, along my partner leaving and a desire for a shorter commute, drove me to decide to move my 2.5 years old practice from Schaumburg to St Charles.Here are some interesting data from my first ten years of practice. It took until Year 5 for me to get a full year of full-time practice. In that year I saw just under 800 sessions (averaging 17 sessions per week) and that was the busiest I had ever been. Recalling the subjective experience of that year, I thought I was doing great, i.e that I was busy and productive. But I was still working 2/3 of what I now would now call full-time. 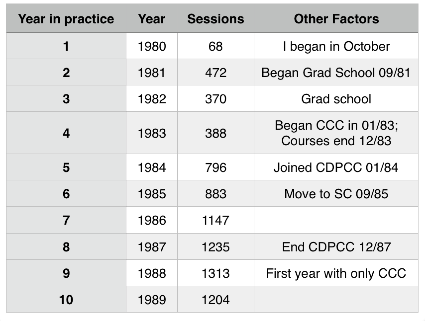 1200 sessions per year (an average of 25 sessions per week) is a pretty common benchmark for full time. It took me almost 7 years to grow to where I had a caseload of over 100 sessions per month, i.e. full-time. Yes there were the interruptions of grad school, but part of why I went to grad school was to be productive while growing a practice. I could see that building a stable practice was going to take a while and that I did not know how to grow any faster so school made sense to me. It took until Year 9 for me to build CCC to a level that could support me and my family. And I did it the way many do it, by doubling up with CCC and CDPCC for Years 5, 6, 7, & 8. Unless one has built a practice from scratch, it is hard to appreciate what beginning really looks like, how hard and slow it is to get to any level of consistency. I had to learn not just how to provide and promote a service that would be valued by the public, but to do it while also learning about the other elements of successful practice. I found it especially hard to build a diversified referral base to carry me through thick and thin. From what I can tell, my early experiences in practice building are not that unique. Lots (maybe all) describe similar experiences. If there is anything important about the details, it is that they became the foundation for the far larger, more enduring practice. Through those first ten years, there was a slowly growing vision of what was possible via a private practice. And as that vision morphed and responded to the changing mental health climate, it eventually grew into the vision of what that practice is today. Why create another mental health practice?